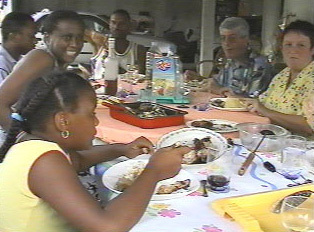 The native cuisine of Martinique offers both varieties of regional French cuisine and traditional creole cooking. French cooking is known for many variations of herbs and seasonings, along with an array of rich sauces, pastry and meat. Creole cooking is known for a predominance of white rice, red beans and many varieties of seafood seasoned with tomatoes, hot peppers, and many exotic regional spices. Breakfast in Martinique is a light meal, consisting of bread and butter, or manioc, a traditional meal of ground roots made into a paste not unlike oatmeal. Some members of the older generation will choose fried fish, while children often simply have the western breakfast of cereal and milk. Breakfast beverages include milk, coffee, juice and hot chocolate. Lunch is the main meal served between 12:00 and 1:00 p.m., and many choose to go home during that time. It is a meal that consists of meat, some kind of carbohydrate such as potatoes or rice, bread and a salad. Dinner is a lighter meal, served at around 8:30 p.m., and generally consists of either soup with vegetables, fish stew, or barbecued chicken, meat, or fish. A typical dessert will include tropical fruit, although some will eat sweets such as pastries, yogurt, ice cream or tropical sherbets. Coffee is served at the end of every meal. Water, juices and wine are taken with the meal. Often children eat a snack at about 6:30 p.m., which usually consists of bread and jam or yogurt, or biscuits with juice. Creole cuisine is distinguished by a variety of punches. One of the favored drinks is a peanut punch made with coconuts and rum, a major export of Martinique. Rum punches can also be made by combining the many tropical fruits of the island, which include pineapple, mango, guava, and banana. When eating out in Martinique, one can find restaurants that offer French cooking characteristic of most of the regions of France. It is very common to find restaurants that offer both Creole and French cuisine. There are also Chinese, Indian, American, Brazilian and Italian places. It is always advisable to make reservations. There are a few American fast food chains, as well as local fast food restaurants, which serve grilled meat or fish on a brochette, with juices and dessert. A 10% tip is courteous but not always essential. One might look at the check to see whether or not a gratuity has already been added to the total. When looking for a snack, one will find street vendors selling baked snacks and sweets. Vendors appear on the roads leading to and from the beaches, selling snowballs, ice cream and topical-flavored sherbets to tourists coming home after a swim. It is important for visitors to understand that the rhythms of Martinique are slower than many other countries, which is one of the reasons it is so popular among vacationers. However, for this same reason, it is not uncommon to have to wait longer in a restaurant or even a shop than one is accustomed. Impatience on the part of a customer would be inappropriate in such situations. There is not much cigarette smoking by residents of Martinique, and it is common to find non-smoking sections in the restaurants. When visiting a person’s home, one never smokes in the house unless one see the host or hostess smoking. In most cases, a guest will automatically go outside to smoke. "Making Juice from Fresh Plums (prune de cythere)"